Rain prevented any chance of a positive result, as Nottinghamshire made it three draws in a row at the Ageas Bowl. Only 9.4 overs were possible on the final day as on-off showers plagued Notts’ chance of winning – the two captains finally shaking hands at 3:30pm. Hampshire opening batsmen Jimmy Adams and Liam Dawson safely negotiated the 40-minute spell after lunch - the only action of the day. The rain left the game meandering towards a draw – Notts had placed themselves into an authoritative position after centuries by Brendan Taylor and Alex Hales – who also missed out on a second ton by six runs before celebrating an England call-up on day three. Notts took a first innings lead of 95 after bowling Hampshire out for an unconvincing 276 before motoring at five an over on Tuesday evening to set an imperious but eventually unnecessary total. Nottinghamshire continue their unbeaten start to the season and move onto 27 points but Hampshire are still to win on their return to Division One – they have 19 points - both teams in mid-table. 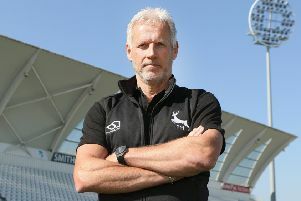 Nottinghamshire’s Director of Cricket Mick Newell said: “We knew the weather forecast wasn’t very good and the way the rain came it was very heavy which made the groundsman’s job very difficult and made the game drift to nowhere. “It would have been an interesting day today. I think Hampshire would have fancied chancing the 390 down on a normal day and we believe we could have bowled them out. “We are playing some very nice cricket and batting very positively. “The batting is going amazingly well for this time of year. The amount of hundreds we are making as a team is a tremendous effort. Hampshire captain Jimmy Adams said: “I think coming into today the draw was all we could hope for. “We had a poor day yesterday so a draw was the best result we could get. The rain has certainly helped that. “I have the confidence we could have batted the day, it would have been a good challenge. “We played some decent cricket in the first few days but again we lacked in certain important phases of the game. “So far this season our seamers have done a lot of yards and we have spent a lot of time in the field – and that can take it’s toll.